On August 17, 2015, a series of articles published in the Times (London) revealed that Yasmin Hussein, currently Amnesty International’s Director of Faith and Human Rights and formerly Director of International Advocacy, has links to the Muslim Brotherhood and possibly to Hamas. Hussein’s husband, Wael Mussabeh, holds a position in the Human Relief Foundation (HRF), which is a member of the Union of Good, an organization banned by Israel in 2008 for its funding of Hamas. Additionally, HRF lists Qatar Charity as one of its “institutional supporters”; this group was named by Osama bin-Laden as a financier of Al-Qaeda. Before working at Amnesty, Hussein was employed at Islamic Relief Worldwide (IRW), banned by Israel in 2014 for its alleged financial connections to Hamas. Yasmin Hussein’s husband, Wael Mussabeh, is the director of both the Human Relief Foundation (HRF) and the Claremont Community Trust (CCT), a UK organization and part of the Muslim Brotherhood support network. She was listed as a Director of CCT from 2003-2015. Hussein formerly served as Director of Communications, External Relations and Advocacy for IRW. In violation of Amnesty International protocol, in 2012 Hussein met with and then slept in the home of Adly Al-Qazzaz, an adviser in the Muslim Brotherhood-led Egyptian government. Qazzaz’s son, Khaled al-Qazzaz, was serving at the time as a foreign affairs adviser to Prime Minister Muhammad Morsi, and his daughter Mona Al-Qazzaz, was serving as the spokesperson of the Muslim Brotherhood in the UK. HRF is a member of the Union of Good, banned by Israel in 2008 for funding Hamas. HRF has also been linked to other Muslim Brotherhood institutions and individuals, including those that were involved in an alleged coup plot in the UAE. HRF and IRW are both members of the Muslim Charities Forum (MCF) in the UK. Another member of MCF, Human Appeal International, has also been linked to the affair in the UAE. Located in Bradford, UK; according to the Times, when founded in 2007, “the trust was said to be running a ‘multicultural’ community centre whose aim was to ‘promote positive understanding and good relationships between diverse communities.’” According to Qatari sources, CCT is part of the Muslim Brotherhood’s support network. 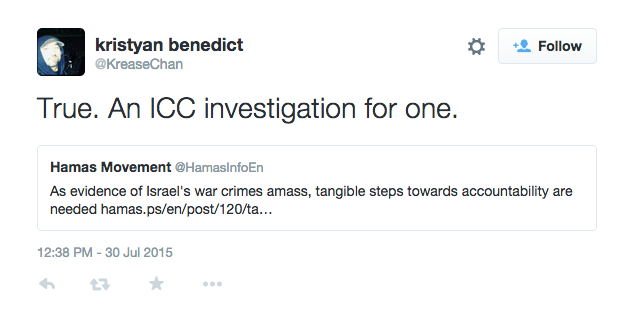 Deborah Hyams was hired in 2010 as “Israel, Occupied Palestinian Territories and Palestinian Authority” researcher. Hyams has an extensive background in radical anti-Israel activism, including acting as a “human shield” in Beit Jala in 2001. Saleh Hijazi, Amnesty campaigner on Israel and the OPT, worked as a Public Relations officer for the Palestinian Authority’s Office of the Ministry of Planning in Ramallah in 2005, and in 2007 he was listed as contact for the NGO “Another Voice” – under the group’s signature “Resist! Boycott! We Are Intifada!” Hijazi has also posted as his profile picture on Facebook, images of PFLP terrorist Leila Khaled and Islamic Jihad spokesman Khader Adnan. A 2012 tweet by Kristyan Benedict, Amnesty-UK’s Campaign Manager, prompted an inquiry into Amnesty by John Mann MP, chair of the UK All-Party Parliamentary Group against Anti-Semitism, seeking clarification on the organization’s policies towards preventing antisemitism. Benedict also has compared Israel to ISIS (using the #JSIL hashtag) and has retweeted an article from Hamas’ website. Edith Garwood, Amnesty-USA’s “Country Specialist on Israel, Occupied Palestinian Territories, and Palestinian Authority,” volunteered for the International Solidarity Movement (ISM) before joining Amnesty. On Amnesty financial scandals, see NGO Monitor on The Irene Khan Affair. Gerald Steinberg debates Irene Khan, head of Amnesty International, on BBC World Service Radio.